Kiwi expedition kayaker Scott Donaldson made significant progress in his first week kayaking across the Tasman from Australia to New Zealand. The 48 year old is making faster progress than his 2014 attempt as he approaches Lord Howe island 600 km (370 mi) directly east of mainland Port Macquarie Australia. Leaving Coffs Harbour on the Australian coast on May 2nd, it's not only favourable currents and weather that's helped Donaldson over the last week, but also better preparation in every aspect of the challenge including a carbon kayak which is 80kgs lighter. " Donaldson initially headed south down the coastline of New South Wales in a strong current, the tactic to enable a ‘slingshot’ out into the Tasman Sea." Donaldson’s team leader, Nigel Escott reports. In 2014 the Kiwi stopped on Lord Howe island for mechanical & electrical repairs which took a few days waiting for parts to be flown in. This time Donaldson is better prepared and is planning to paddle straight past the island according to Escott. Donaldson in on track to be significantly faster than his 84 days previously with his fast progress and just over 1600km remaining to New Zealand. This should reduce the risk significantly of running out of food (required a plane supply drop in 2014) to mechanical problems (desalination water), weathering storms (sea anchor broke 2014) or injury to fatigue. Donaldson aims to make landfall on the Taranaki Coast – a distance of 2200 kilometres although he will likely paddle 3000 kilometres. As hoped the weather for the first leg of Donaldson’s attempt has been very favourable, allowing him to cover a significant distance, Escott reports. 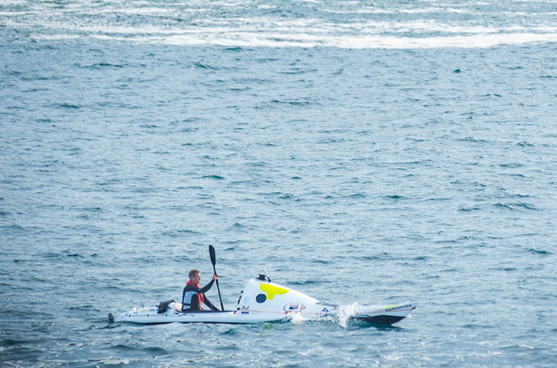 With his Trans-Tasman Kayak attempt, Donaldson is raising awareness about Asthma, a condition he suffers from.